First of all, I'd just like to know if anyone has tried feeding their birds Beak Appetite? ( http://www.beakappetite.com ) That's probably a long shot as I don't know if it's available outside of America. It's a food that you warm up and serve as a nice messy goop and it comes in lots of different flavors. I'd love to get this for my birds but I don't know what flavor would be most popular with them. I think they'd take to it really well though. 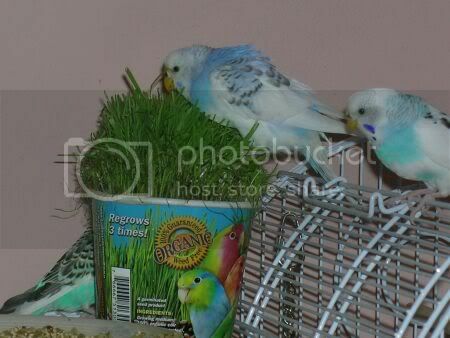 My other question, does anyone grow wheatgrass for your budgies? I've heard from several people/websites that it is a really great source of all sorts of nutrients! I'd love to grow it for my birds and just wondered if anyone had any tips. Le Grass Cafe is a tub of convenient, ready to grow organic wheatgrass. Simply add water to the fill line, leave on a windowsill and in 4 to 5 days you're ready to feed fresh wholesome greens to your bird or animal. Le Grass Cafe is a living food, containing 16 vitamins, 13 minerals and 18 amino acids. Best of all it will regrow up to 3 times. Suitable for all birds from finches to macaws, plus dogs, cats, reptiles, rabbits, rodents etc. Thank you!! That's the exact same thing that the makers of Beak Appetite sell, I just didn't know if they'd take to it. I think I will definitely be getting the le grass cafe stuff or finding some organic seeds to grow from. I hope mine like it as much as yours did. That sounds great! If you find anyone that ships to West Aust (and we have REALLY strict quarantine laws), or if someone knows a supplier here, my birds would thank you from the bottom of their beaks! Andy what section is it in on the website I cant seem to find it and want to order some grass today! :(Laughing out loud): How funny! I wonder if you can get "Le Grass Cafe" in Canberra. Dunno Bea I cant find it on that site Andy said or anywhere else on a non American site but I really want some now - maybe Andy can help when he gets here! 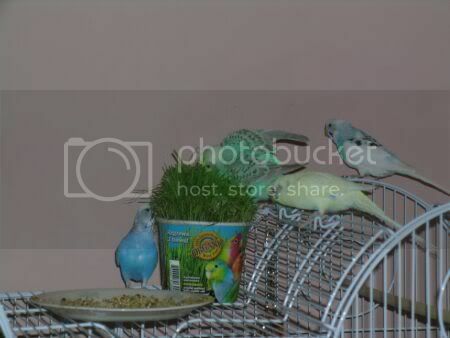 its in the small birds section http://www.everythingforpets.com/beak_appe...id.2309.dept.0/ i'm surprised you didnt see it when i got you to spend millions of pounds there! Thanks Andy, I searched but couldnt find it but I have now ordered not one nope 2 of them hehehe. have you tried it? I feed both. Actually, I offer both, but so far they are not liking the beak appetit. Which is bad, because they really need to eat it as their diet is somewhat restricted now. I've tried several flavors, but so far nothing. They have tasted it, but then shake their heads and give me this look...I think it is the texture. They have never liked cooked food and I wonder if it is because it is smushy. So now I've sprinkled a few seeds on top of it and hope that will be enough to entice them to eat it. But at least it shows they are normal, because in the wild if birds jumped all over new food they could end up poisoned or sick. That's one reason it is so hard to convert birds to a new diet. I'll just keep buying it until they eat it. Beak Appetit also offers veggies in a container just like the other, and I've just started cooking that for them too. eterri, it took a few days of offering the wheatgrass before they weren't afraid of it, but now I give it to them every day and they love it. If you sprinkle it with water before you give it to them they take a bath in it as well as eat it. I like it because it is organic. he he i just ordered some as well, also ordered some wooden perches as they are a lot cheaper on that site and some budgie honey treats ?1.16 for 10 honey bars- bargain!! Rainbow do you feed them the grass like Andy posted the one you grow yourself - Ive just ordered a couple of pots to give it a go. What are the veggies like in the pots I would like to try as many different things as possible! Some things are bargains, others are not Ive spent pounds on that site - but thats all Andys fault he made me do it hehe! The veggies are called Veggie Heaven, they are by Beak Appetit in the same kind of tub, and they contain dehydrated veggies like carrots, bell peppers, potatoes, peas, zucchini, sweet corn, and a few others. You cook these too. I have hopes mine will begin to eat them too, because guess what???? THEY ATE THE BEAK APPETIT TODAY!!!! I was video taping one of them bathing in the wheatgrass, (I'm going to try to upload it so you can see) when Mystery got brave enough to try it. Apparently she liked it because when the others came to investigate, she thought it all belonged to her. :budgiedance: Four of them tried it this morning, so I hope the rest will get with the program soon. It only took them three weeks.......LOL. Oh fantastic Rainbow - I think i will probably have to cut some off and clip it in the cage that big pot will scare them I think. You will have to let me know hwo the veggie stuff goes if you get some success I may try ordering some of that if I can get hold of it. The big pot did scare them at first...I have a picture somewhere of them all sitting as far away from it as possible, just staring at it.... it took a few days before they got brave enough to taste it. 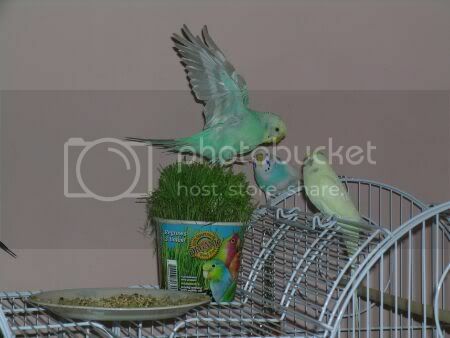 I'm not sure how well it would clip to the side of the cage, because it's like regular grass. maybe put some in a pot insted? Wow Anne what a good idea and if they dont eat it then I will myself I LOVE tomato sauce - Heinz of course hehe! Right Ive now just now ordered Beak Appetit Cream of Tweet, sounds quite yummy actually and you can cook it in the microwave only thing is you have to cook it all at once and it only lasts in the fridge for 5 days and it makes over a lb of food. Have you tried this one Rainbow? Yes. It does make a lot of food. I don't know which flavor will be the biggest hit, as a few them only have begun tasting it yesterday. They have not eaten it yet today. It will just take time I suppose. You will probably go through several tubs, just throwing it out, until they decide it is okay to eat it. No way I'll eat it myself if they wont at ?3.99 a tub hehehe - it actually looks quite nice doesnt it? Hope it arrives soon. okay my La Grass Cafe has arrived this morning, Ive planted my seeds and its sitting on the window sill in the sunshine - wish it was quicker than 4-5 days though hehe!